Globally, the development of bioeconomy is driven by four main factors: climate change, rapid population growth, depletion of natural resources and consumer awareness of the environment, which all, consequently, lead to increased demands on finding a substitute for fossil economy. Great potential is in increasing solutions based on renewable natural resources. The goal of the Finnish Biotechnology Strategy is to create economic growth and jobs through business growth, high-quality products and services. Norway has a similar strategy and Sweden is in the process of preparing its own. The northern parts of Finland, Sweden and Norway form a region with a significant bioeconomical potential, which is broadly based on a variety of industries. The expertise gained by Nordic high-level education combined with the abundant amount of solid and intangible raw materials of the Nordic region create excellent conditions for economic sustainability and success. Lapland University of Applied Sciences has developed education on bioeconomy specialization together with other Finnish universities of applied sciences and working life representatives. Training has been developed to respond efficiently and faster to the competence needs of bioeconomy than the actual degree programs. The competence needs throughout Finland have been examined in the survey, and also local processes typical to certain geographic areas were considered in the process. Lapland and Oulu universities of applied sciences have been in charge of this development work in Northern Finland. The survey of the competence needs found out that to promote bioeconomy you have to be able to combine different areas of expertise to create new use of bio mass resources. This enables you to build new kind of networks and symbiotic relationships between enterprises even from different lines of industries. International competence became an important part of the organization’s expansion as well as keeping up to date with the latest development. The development of international competence was particularly important in the industries where the operations were already aimed at international markets. International competence means the skills required to utilize international innovations, knowledge and networks in the work and development. In general, you need the written and communication skills of at least one foreign language and you need to be able to utilize international sources of information in your field. When working abroad, you must understand the cultural differences to be able to co-operate successfully. Understanding the impacts and opportunities of internationalization in the field of your profession is essential in order to efficiently target the resources of the organization. Finland, Sweden and Norway have long and successful tradition in cross-border cooperation due to low differences in cultural and business environment. International cooperation in the northern border regions improves the opportunities for companies to take advantage of each other’s resources both in terms of competence and raw materials. The development of bio-based value chains promotes raw material efficiency and creates possibilities for developing new products on the market. The development of international relations and joint business also creates individual opportunities to employees to make use of their expertise in different countries. Picture 1. Nordic universities can support the development of cross-border competence. A survey of the competence needs of bioeconomy has been made in Finland, but similar survey could also be targeted to Northern parts of Finland, Sweden and Norway, taking into account the internationalization perspective. The survey would provide information on what kind of expertise organizations in different countries need to develop cross-border bioeconomic cooperation and how education should be organized. Responsibility for carrying out the study would naturally belong to educational organizations in different countries, which would also provide education according to the needs defined in the survey. 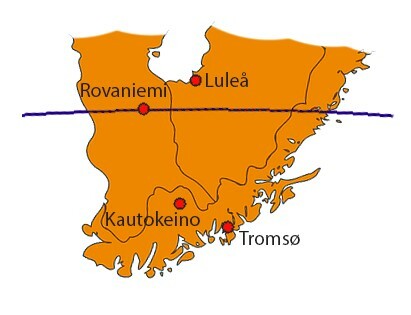 Hanhijoki, I., Honkasalo, R., Nyyssölä, K., Savioja, H., Taipale-Lehto, U., Vepsäläinen, J. & Anttila, J. 2016. Ennakoinnin koontikatsaus – Osaamis- ja koulutustarpeiden ennakointituloksia. Raportit ja selvitykset 2016, Opetushallitus. Kruus, K. 2017. Tie biotalouteen -ohjelman yhteenveto. Santala, K. 2017. Biotalouden erikoistumiskoulutuksen osaamis- ja koulutustarvekartoitus Lapin metsäsektorille.Suomen biotalousstrategia 2014. Työ- ja elinkeinoministeriö.